This article is about the Roman Emperor. For the personal name, see Tiberius (praenomen). For other persons named Tiberius and other uses, see Tiberius (disambiguation). 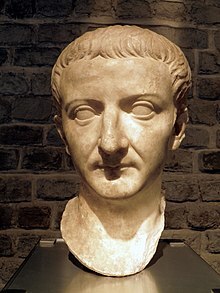 Tiberius (/taɪˈbɪəriəs/; Latin: Tiberius Caesar Divi Augusti filius Augustus; 16 November 42 BC – 16 March 37 AD) was Roman emperor from 14 AD to 37 AD, succeeding the first emperor, Augustus. Born to Tiberius Claudius Nero and Livia Drusilla in a Claudian family, he was given the personal name Tiberius Claudius Nero. His mother divorced Nero and married Octavian—later to ascend to Emperor as Augustus—who officially became his stepfather. Tiberius would later marry Augustus' daughter (from his marriage to Scribonia), Julia the Elder, and even later be adopted by Augustus. Through the adoption, he officially became a Julian, assuming the name Tiberius Julius Caesar. The emperors after Tiberius would continue this blended dynasty of both families for the following thirty years; historians have named it the Julio-Claudian dynasty. His relationship to the other emperors of this dynasty was as follows: Tiberius was the stepson of Augustus, grand-uncle of Caligula, paternal uncle of Claudius, and great-grand uncle of Nero. His 22-and-a-half-year reign would be the longest after Augustus's until Antoninus Pius, who surpassed his reign by a few months. Tiberius was one of the greatest Roman generals; his conquest of Pannonia, Dalmatia, Raetia, and temporarily, parts of Germania, laid the foundations for the northern frontier. Even so, he came to be remembered as a dark, reclusive and sombre ruler who never really desired to be emperor; Pliny the Elder called him "the gloomiest of men." After the death of his son Drusus Julius Caesar in 23 AD, Tiberius became more reclusive and aloof. In 26 AD he removed himself from Rome and left administration largely in the hands of his unscrupulous Praetorian prefects Lucius Aelius Sejanus and Quintus Naevius Sutorius Macro. When Tiberius died, he was succeeded by his grand-nephew and adopted grandson, Caligula. Tiberius was born in Rome on 16 November 42 BC to Tiberius Claudius Nero and Livia. In 39 BC his mother divorced his biological father and remarried Gaius Julius Caesar Octavianus shortly thereafter, while still pregnant with Tiberius Nero's son. In 38 BC his brother, Nero Claudius Drusus, was born. Little is recorded of Tiberius' early life. In 32 BC Tiberius, at the age of nine, delivered the eulogy for his biological father at the rostra. In 29 BC, he rode in the triumphal chariot along with his adoptive father Octavian in celebration of the defeat of Antony and Cleopatra at Actium. Shortly thereafter Tiberius began appearing in court as an advocate, and it is presumably here that his interest in Greek rhetoric began. In 20 BC, Tiberius was sent East under Marcus Vipsanius Agrippa. The Parthian Empire had captured the standards of the legions under the command of Marcus Licinius Crassus (53 BC) (at the Battle of Carrhae), Decidius Saxa (40 BC), and Mark Antony (36 BC). After a year of negotiation, Tiberius led a sizable force into Armenia, presumably with the goal of establishing it as a Roman client state and ending the threat it posed on the Roman-Parthian border. Augustus was able to reach a compromise whereby the standards were returned, and Armenia remained a neutral territory between the two powers. 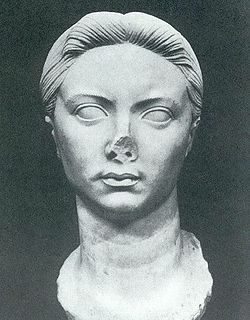 A bust of Vipsania Agrippina, Tiberius' first wife, recovered from Leptis Magna. Tiberius married Vipsania Agrippina, the daughter of Augustus’s close friend and greatest general, Marcus Vipsanius Agrippa. He was appointed to the position of praetor, and was sent with his legions to assist his brother Drusus in campaigns in the west. While Drusus focused his forces in Gallia Narbonensis and along the German frontier, Tiberius combated the tribes in the Alps and within Transalpine Gaul, conquering Raetia. In 15 BC he discovered the sources of the Danube, and soon afterwards the bend of the middle course. Returning to Rome in 13 BC, Tiberius was appointed as consul, and around this same time his son, Drusus Julius Caesar, was born. Agrippa's death in 12 BC elevated Tiberius and Drusus with respect to the succession. At Augustus’ request in 11 BC, Tiberius divorced Vipsania and married Julia the Elder, Augustus' daughter and Agrippa's widow. Tiberius was very reluctant to do this, as Julia had made advances to him when she was married and Tiberius was happily married. His new marriage with Julia was happy at first, but turned sour. In 6 BC, Tiberius launched a pincer movement against the Marcomanni. Setting out northwest from Carnuntum on the Danube with four legions, Tiberius passed through Quadi territory in order to invade Marcomanni territory from the east. Meanwhile, general Gaius Sentius Saturninus would depart east from Moguntiacum on the Rhine with two or three legions, pass through newly annexed Hermunduri territory, and attack the Marcomanni from the west. The campaign was a resounding success, but Tiberius could not subjugate the Marcomanni because he was soon summoned to the Rhine frontier to protect Rome's new conquests in Germania. He returned to Rome and was consul for a second time in 7 BC, and in 6 BC was granted tribunician power (tribunicia potestas) and control in the East, all of which mirrored positions that Agrippa had previously held. However, despite these successes and despite his advancement, Tiberius was not happy. Tiberius' move thus seemed to be an interim solution: he would hold power only until his stepsons would come of age, and then be swept aside. The promiscuous, and very public, behavior of his unhappily married wife, Julia, may have also played a part. Indeed, Tacitus calls it Tiberius' intima causa, his innermost reason for departing for Rhodes, and seems to ascribe the entire move to a hatred of Julia and a longing for Vipsania. Tiberius had found himself married to a woman he loathed, who publicly humiliated him with nighttime escapades in the Roman Forum, and forbidden to see the woman he had loved. The death of Gaius in AD 4 initiated a flurry of activity in the household of Augustus. 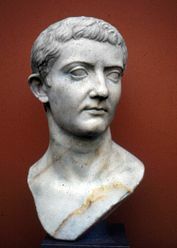 Tiberius was adopted as full son and heir and in turn, he was required to adopt his nephew, Germanicus, the son of his brother Drusus and Augustus' niece Antonia Minor. Along with his adoption, Tiberius received tribunician power as well as a share of Augustus's maius imperium, something that even Marcus Agrippa may never have had. In AD 7, Agrippa Postumus, a younger brother of Gaius and Lucius, was disowned by Augustus and banished to the island of Pianosa, to live in solitary confinement. Thus, when in AD 13, the powers held by Tiberius were made equal, rather than second, to Augustus' own powers, he was for all intents and purposes a "co-princeps" with Augustus, and, in the event of the latter's passing, would simply continue to rule without an interregnum or possible upheaval. The Senate convened on 18 September, to validate Tiberius's position as Princeps and, as it had done with Augustus before, extend the powers of the position to him. These proceedings are fully accounted by Tacitus. Tiberius already had the administrative and political powers of the Princeps, all he lacked were the titles—Augustus, Pater Patriae, and the Civic Crown (a crown made from laurel and oak, in honor of Augustus having saved the lives of Roman citizens). Tiberius, however, attempted to play the same role as Augustus: that of the reluctant public servant who wants nothing more than to serve the state. This ended up throwing the entire affair into confusion, and rather than humble, he came across as derisive; rather than seeming to want to serve the state, he seemed obstructive. He cited his age as a reason why he could not act as Princeps, stated he did not wish the position, and then proceeded to ask for only a section of the state. Tiberius finally relented and accepted the powers voted to him, though according to Tacitus and Suetonius he refused to bear the titles Pater Patriae, Imperator, and Augustus, and declined the most solid emblem of the Princeps, the Civic Crown and laurels. Problems arose quickly for the new Princeps. The Roman legions posted in Pannonia and in Germania had not been paid the bonuses promised them by Augustus, and after a short period of time mutinied when it was clear that a response from Tiberius was not forthcoming. Germanicus and Tiberius's son, Drusus Julius Caesar, were dispatched with a small force to quell the uprising and bring the legions back in line. Rather than simply quell the mutiny, however, Germanicus rallied the mutineers and led them on a short campaign across the Rhine into Germanic territory, stating that whatever treasure they could grab would count as their bonus. Germanicus's forces crossed the Rhine and quickly occupied all of the territory between the Rhine and the Elbe. Additionally, Tacitus records the capture of the Teutoburg forest and the reclaiming of Roman standards lost years before by Publius Quinctilius Varus, when three Roman legions and its auxiliary cohorts had been ambushed by Germanic tribes. After being recalled from Germania, Germanicus celebrated a triumph in Rome in AD 17, the first full triumph that the city had seen since Augustus's own in 29 BC. As a result, in AD 18 Germanicus was granted control over the eastern part of the empire, just as both Agrippa and Tiberius had received before, and was clearly the successor to Tiberius. Germanicus survived a little over a year before dying, accusing Gnaeus Calpurnius Piso, the governor of Syria, of poisoning him. Lucius Aelius Sejanus had served the imperial family for almost twenty years when he became Praetorian Prefect in AD 15. As Tiberius became more embittered with the position of Princeps, he began to depend more and more upon the limited secretariat left to him by Augustus, and specifically upon Sejanus and the Praetorians. In AD 17 or 18, Tiberius had trimmed the ranks of the Praetorian Guard responsible for the defense of the city, and had moved it from encampments outside of the city walls into the city itself, giving Sejanus access to somewhere between 6000 and 9000 troops. Sejanus began a series of purge trials of Senators and wealthy equestrians in the city of Rome, removing those capable of opposing his power as well as extending the imperial (and his own) treasury. Germanicus's widow Agrippina the Elder and two of her sons, Nero Julius Caesar and Drusus Caesar were arrested and exiled in AD 30 and later all died in suspicious circumstances. In Sejanus's purge of Agrippina the Elder and her family, Caligula, Agrippina the Younger, Julia Drusilla, and Julia Livilla were the only survivors. Ruins from the Villa Jovis on the island of Capri, where Tiberius spent much of his final years, leaving control of the empire in the hands of the prefect Lucius Aelius Sejanus. In 31, Sejanus held the consulship with Tiberius in absentia, and began his play for power in earnest. Precisely what happened is difficult to determine, but Sejanus seems to have covertly attempted to court those families who were tied to the Julians, and attempted to ingratiate himself with the Julian family line with an eye towards placing himself, as an adopted Julian, in the position of Princeps, or as a possible regent. Livilla was later implicated in this plot, and was revealed to have been Sejanus's lover for a number of years. The plot seems to have involved the two of them overthrowing Tiberius, with the support of the Julians, and either assuming the Principate themselves, or serving as regent to the young Tiberius Gemellus or possibly even Caligula. Those who stood in his way were tried for treason and swiftly dealt with. In AD 31 Sejanus was summoned to a meeting of the Senate, where a letter from Tiberius was read condemning Sejanus and ordering his immediate execution. Sejanus was tried, and he and several of his colleagues were executed within the week. As commander of the Praetorian Guard, he was replaced by Naevius Sutorius Macro. Little was done to either secure or indicate how his succession was to take place; the Julians and their supporters had fallen to the wrath of Sejanus, and his own sons and immediate family were dead. Two of the candidates were either Caligula, the sole surviving son of Germanicus, or Tiberius' own grandson, Tiberius Gemellus. However, only a half-hearted attempt at the end of Tiberius' life was made to make Caligula a quaestor, and thus give him some credibility as a possible successor, while Gemellus himself was still only a teenager and thus completely unsuitable for some years to come. After his death, the Senate refused to vote Tiberius the divine honors that had been paid to Augustus, and mobs filled the streets yelling "To the Tiber with Tiberius! "; the bodies of criminals were typically thrown into the river, instead of being buried or burnt. However, the emperor was cremated, and his ashes were quietly laid in the Mausoleum of Augustus, later to be scattered in AD 410 during the Sack of Rome. The result was a stronger, more consolidated empire. Of the authors whose texts have survived, only four describe the reign of Tiberius in considerable detail: Tacitus, Suetonius, Cassius Dio and Marcus Velleius Paterculus. Fragmentary evidence also remains from Pliny the Elder, Strabo and Seneca the Elder. Tiberius himself wrote an autobiography which Suetonius describes as "brief and sketchy", but this book has been lost. The most detailed account of this period is handed down to us by Tacitus, whose Annals dedicate the first six books entirely to the reign of Tiberius. Tacitus was a Roman senator, born during the reign of Nero in AD 56, and consul suffect in AD 97. His text is largely based on the Acta Senatus (the minutes of the session of the Senate) and the Acta Diurna (a collection of the acts of the government and news of the court and capital), as well as speeches by Tiberius himself, and the histories of contemporaries such as Marcus Cluvius Rufus, Fabius Rusticus and Pliny the Elder (all of which are lost). 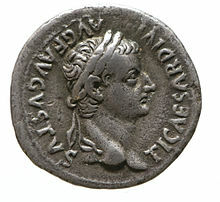 An example of Indo-Roman trade and relations during the period: silver denarius of Tiberius (14–37) found in India and Indian copy of the same, 1st-century coin of Kushan king Kujula Kadphises copying a coin of Augustus. Suetonius was an equestrian who held administrative posts during the reigns of Trajan and Hadrian. The Twelve Caesars details a biographical history of the principate from the birth of Julius Caesar to the death of Domitian in AD 96. Like Tacitus, he drew upon the imperial archives, as well as histories by Aufidius Bassus, Marcus Cluvius Rufus, Fabius Rusticus and Augustus' own letters. One of the few surviving sources contemporary with the rule of Tiberius comes from Velleius Paterculus, who served under Tiberius for eight years (from AD 4) in Germany and Pannonia as praefect of cavalry and legatus. Paterculus' Compendium of Roman History spans a period from the fall of Troy to the death of Livia in AD 29. His text on Tiberius lavishes praise on both the emperor and Sejanus. How much of this is due to genuine admiration or prudence remains an open question, but it has been conjectured that he was put to death in AD 31 as a friend of Sejanus. The tribute penny mentioned in the Bible is commonly believed to be a Roman denarius depicting the Emperor Tiberius. Caption: TI. CAESAR DIVI AVG. F. AVGVSTVS / MAXIM. PONTIF. The Gospels mention that during Tiberius' reign, Jesus of Nazareth preached and was executed under the authority of Pontius Pilate, the Roman governor of Judaea province. In the Bible, Tiberius is mentioned by name in Luke 3:1, which states that John the Baptist entered on his public ministry in the fifteenth year of his reign. The city of Tiberias (named after Tiberius) referenced in John 6:23  is located on the Sea of Galilee, which was also known as the Sea of Tiberias and is referenced in John 6:1, . Many other references to Caesar (or the emperor in some other translations), without further specification, would seem to refer to Tiberius. Similarly, the "tribute penny" referred to in Matthew and Mark is popularly thought to be a silver denarius coin of Tiberius. The palace of Tiberius at Rome was located on the Palatine Hill, the ruins of which can still be seen today. No major public works were undertaken in the city during his reign, except a temple dedicated to Augustus and the restoration of the theater of Pompey, both of which were not finished until the reign of Caligula. In addition, remnants of Tiberius' villa at Sperlonga, which includes a grotto where the important Sperlonga sculptures were found in fragments, and the Villa Jovis on top of Capri have been preserved. The estate at Capri is said by Tacitus to have included a total of twelve villas across the island, of which Villa Jovis was the largest. Tiberius refused to be worshipped as a living god, and allowed only one temple to be built in his honor, at Smyrna. The town Tiberias, in modern Israel on the western shore of the Sea of Galilee, was named in Tiberius's honour by Herod Antipas. The theft of the Gold Tiberius, an unintentionally unique commemorative coin commissioned by Tiberius which is stated to have achieved legendary status in the centuries hence, from a mysterious triad of occultists drives the plot of the framing story in Arthur Machen's 1895 novel The Three Impostors. Tiberius has been represented in fiction, in literature, film and television, and in video games, often as a peripheral character in the central storyline. One such modern representation is in the novel I, Claudius by Robert Graves, and the consequent BBC television series adaptation, where he is portrayed by George Baker. George R. R. Martin, the author of The Song of Ice and Fire series, has stated that central character Stannis Baratheon is partially inspired by Tiberius Caesar, and particularly the portrayal by Baker. In the 1968 ITV historical drama The Caesars, Tiberius (by André Morell) is the central character for much of the series and is portrayed in a much more balanced way than in I, Claudius. He also appears as a minor character in the 2006 film The Inquiry, in which he is played by Max von Sydow. In addition, Tiberius has prominent roles in Ben-Hur (played by George Relph in his last starring role), and in A.D. (played by James Mason). Played by Ernest Thesiger, he featured in The Robe (1953). He was featured in the 1979 film Caligula, portrayed by Peter O'Toole. He was an important character in Taylor Caldwell's 1958 novel, Dear and Glorious Physician, a biography of St Luke the Evangelist, author of the third canonical Gospel. Infant son, (dubbed "Tiberillus" by modern historians), died in infancy. ^ "Tiberius | Roman emperor". Encyclopedia Britannica. Retrieved 2018-03-08. ^ Seager 2005, pp. 20. ^ Seager 2005, pp. 23. ^ Seager 2005, pp. 23—24. ^ a b c Seager 2005, pp. 26. ^ Seager 2005, pp. 28. ^ Seager 2005, pp. 44—45. ^ Platner, Samuel Ball; Ashby, Thomas (1929). "Mausoleum Augusti". A Topographical Dictionary of Ancient Rome. London: Oxford University Press. pp. 332–336. Retrieved 30 June 2011. ^ Caligula would kill Tiberius Gemellus and Antonia Minor before being killed by his own personal guard. Tiberius' nephew Claudius succeeded Caligula and executed Caligula's sister Julia Livilla and in turn would be murdered by Livilla's sister Agrippina the Younger after they married and her son was of an age to become emperor. Agrippina would be executed by her son Nero, who would later commit suicide in 68 AD with no heirs to succeed him. Only Caligula's sister Julia Drusilla died of natural causes. ^ Sir William Smith (1896). The Old Testament History: From The Creation To The Return Of The Jews From Captivity (page 704). Kessinger Publishing, LLC (22 May 2010). ISBN 1-162-09864-3. ^ The Numismatist, Volume 29 (page 536). American Numismatic Association (3 April 2010). 2010. ISBN 978-1-148-52633-1. ^ Hobson, Burton (1972). Coins and coin collecting (page 28). Dover Publications (April 1972). ISBN 0-486-22763-4. ^ a b c d e f Jossa, Giorgio (2006). Jews or Christians. pp. 123–126. ISBN 3-16-149192-0. ^ "I, Claudius: From the Autobiography of Tiberius Claudius – Robert Graves". Booktalk.org. Archived from the original on 18 June 2008. Retrieved 2008-09-20. ^ "BBC Four Drama – I, Claudius". BBC. Retrieved 2008-09-20. ^ "Not a Blog: It's the Pits". 2013-01-21. Retrieved 2016-12-27. ^ "Emperor Tiberius Caesar (Character)". Imdb.com. Retrieved 2008-09-20.